Aberdeen defender Andrew Considine has admitted he is relishing the opportunity to play in front of a full house at Pittodrie against Rangers on Wednesday. The Dons maintained their unbeaten start to the second half of the season in Scotland with a 2-1 win over Hibernian at Pittodrie on Saturday. Despite conceding an early goal in the ninth minute, the hosts turned the tide with the help of first half goals from Considine and Gary Mackay-Steven. 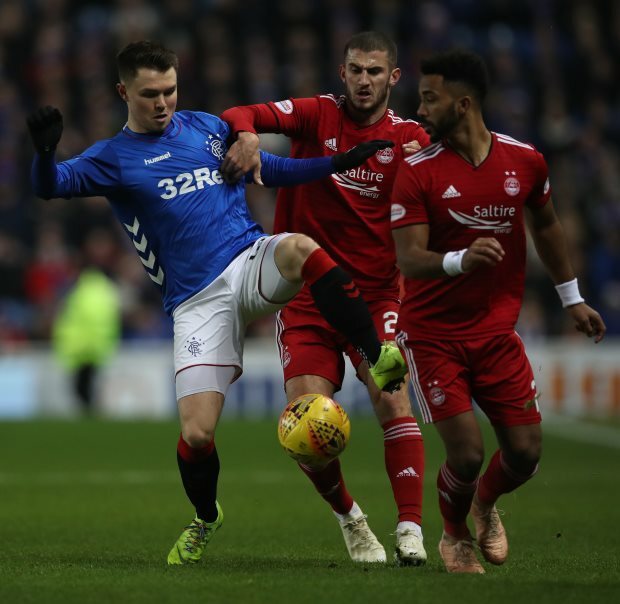 The result meant that Aberdeen are still in close pursuit of second-placed Rangers, who are just two points ahead at the moment, in the Premiership table. And Derek McInnes’ men have an opportunity to bridge the gap on Wednesday, when they host Rangers in their own backyard. Considine insisted that a fixture against Rangers is always exciting and admitted he cannot wait to be part of the game on Wednesday in front of a full house at Pittodrie. “Rangers is a fixture regardless of what time of season or what’s going on, is always going to be exciting”, Considine told RED TV. “The manager drilled it into us to just get the result today and then we can look forward to Wednesday. “Each time we just take care of ourselves and it’s set up to be a good game. "I’m sure it’ll be a full house at Pittodrie and that’s why you play football. Aberdeen edged Rangers to record a 1-0 win during the reverse fixture between the sides at Ibrox back in December.